The words of the classic song seemed to echo through the San Jacinto Student Union, but this time there was a twist to the tune: "I shot the sheriff, and the sheriff shot the deputy." The action was intense at San Jac Con this past weekend as the Sheriff and Deputy battled it out in the streets of an unnamed Western town to see who would be "The Last Man Standing." 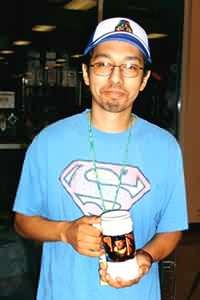 These were just two of the characters engaged in the gunfight and, when the smoke cleared (or the dice stopped rolling, to be more precise) in the small downstairs game area, Robert Villarreal stood victorious as the sole survivor. 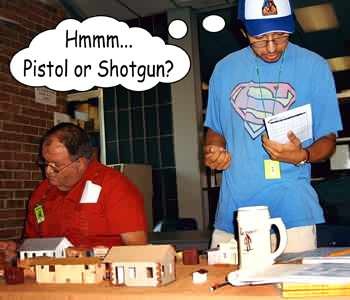 The victory was even more solid because this was the first time Robert had played Gutshot and he actually bested one of the "old guns" of the game, Richard Nelson, who has been playing since the early public playtests at OwlCon in 2001. "I guess in some ways, you might say Richard is our Number One Fan," said Gutshot co-creator and GM Mike Mitchell. "He's been following our progress for years and we're very thankful for his steadfast support." As for the action, Mitchell was impressed. Robert Villarreal poses with the spoils of his victorious assault in the "Last Man Standing" game at San Con. Richard Nelson (left) checks how much Damage the Sheriff has taken as Robert considers his weapon options -- range or killing power? "The battle was actually pretty heated," Mitchell said," neither Richard nor Robert asked for any quarter, and none was given." Mitchell said that although the game, and the convention in general, were small, he had a good time and was pleased to meet the convention staff. "The con organizers seemed to have done a very nice job for a small convention," Mitchell said. "I'm glad I made the hour-long drive from North Houston down south to Pasadena." He added that he was looking forward to making that drive more often this fall as the Gutshot Posse plans to start focusing more attention and committing more time to visiting the game stores and clubs in that part of town. If you have a game store or club and would like to arrange for a demo game, please contact Mike Mitchell for more information.